The RT-12 rotary positioner is designed using our unique, cost-effective philosophy. 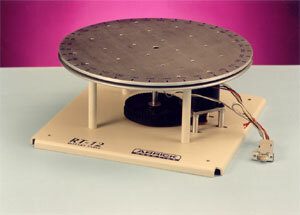 The RT-12 can be used to position a variety of payloads such as cameras, lasers or test fixtures. The 12" diameter aluminum top plate has 24 tapped holes to attach your application. An endless variety of configurations can be created by attaching a linear positioner such as our Z-2 or X-9 to the RT-12. User the MD-2ac motion control system to control the RT-12 with your PC. Use a PR23-3 pulley reducer for finer resolution, more torque, and greater performance. Shipping costs are estimates inside the continental US. See a mechanical drawing for the RT-12 rotary positioner.